The Risks of a One-Year M.B.A. It certainly seems like a good deal: A full-fledged M.B.A. degree in half the time and for less money. But is it? While business schools in Europe for years have favored a shorter M.B.A., institutions stateside and elsewhere have lately been warming to one-year degrees as they seek to appeal to cost-conscious students. Northwestern University's Kellogg School of Management announced earlier this year that it plans to at least double the size of its one-year option, for example, while Melbourne Business School at Australia's University of Melbourne this fall is replacing its 16- and 20-month courses with a 12-month offering as demand grows for even more abbreviated programs. The appetite is real. A survey this year by QS Quacquarelli Symonds Ltd., a business-education research company, found that 29% of U.S. and Canadian respondents preferred programs of 10 to 18 months, up from 21% in 2009. Preference for programs lasting 19 to 24 months fell to 57% from 71% in that time. But as business students learn, it isn't just about cost. 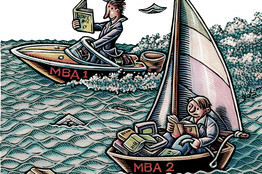 Prospective one-year M.B.A. programs need to consider the benefits of the one-year option, as well as the drawbacks, which include fewer networking opportunities, the potential loss of a summer internship—often the key to landing a full-time job—and deep immersion in individual subjects. "Thinking that you can learn all the basics of management in just one year is simply impossible," says Jordi Canals, dean at University of Navarra's IESE Business School in Spain. Mr. Canals—whose school's only full-time M.B.A. program takes two years to complete—says it takes at least seven or eight months to learn the fundamentals of business, such as strategy, marketing and finance, and another year to gain "literacy" in those areas. Betsy Ziegler, associate dean of M.B.A. programs and dean of students at Kellogg, says one-year students are required to come in with some business courses under their belt—most have undergraduate business degrees—which allow them to jump right into higher-level courses, electives and club activities. Tuition for Kellogg's one-year M.B.A. is $75,400, and the two-year option costs $56,550 a year. One-year M.B.A. students often can't participate in summer internships at coveted firms, such as those in finance, making it near impossible for them to land full-time jobs there after graduation. Goldman Sachs Group Inc. GS +1.62% says the majority of its associate hires come from internship programs, while the summer intern pool accounts for nearly all M.B.A. hires at Morgan Stanley MS +1.64% . Both companies say they focus internship recruiting mainly on two-year programs.Though students generally pay less for a one-year M.B.A., the immediate return is also smaller. Two-year M.B.A.s from the class of 2011 reported median starting salaries of $85,000, but that figure was $73,203 for those graduating from one-year programs, according to a report from the Graduate Management Admission Council. While 86% of two-year M.B.A. graduates reported being employed after graduation, 75% of those in one-year programs did. To give its one-year M.B.A. students a leg up, University of Oxford's Saïd Business School this year is matching 10 incoming students with employers for eight-to-12-week assignments before classes begin. The school declined to name participating employers. Also with summer internships on its agenda, the University of Miami School of Business Administration conducts its one-year M.B.A. on a calendar cycle, breaking for the summer months, rather than a traditional academic year. But it is still not easy to pull off an internship, since recruiting usually kicks off in January, days after the one-year students arrive. "They've got to really hit the ground running," says Gene Anderson, the school's dean. Of course, a one-year option holds significant value for some students. Administrators say it can be a good fit for those with strong work experience and a clear career path. A one-year program may suit someone who wants to shift from finance to strategy within the same company or stay in marketing but at a different firm. For students seeking a total career change, a two-year M.B.A. may be a better option, Mr. Anderson says, because the internship and additional electives, along with club and group travel activities provide "a broader set of opportunities to soak things in" and explore new job paths. In other words, the shorter program is a mild career accelerant, while the two-year option is a launch pad. As prospective students better understand the different experiences and outcomes, some have soured on the speedy approach. University of Miami's business school, which began offering a one-year M.B.A. in 2006, has seen applications fall by nearly half, to 54 for the class that started in January, down from 103 for the class five years earlier. Miami also offers a two-year degree. The one-year program at IE Business School in Madrid initially appealed to Jeff Taylor, who enrolled with plans to switch from education to human-resources without taking too much time or loan debt. After graduating this year, he's now an analyst in the human-resources department of a renewable energy company. Despite landing a job in the industry he wanted, Mr. Taylor says he's still waiting for his return on the investment to "kick in." Many others in his department don't have M.B.A.s, and he says he earns less now than he did as a teacher—under €35,000 ($42,800). Mr. Canals of IESE admits his school might turn off prospective students because other local offerings last just one year. But he says: "If someone's just considering length and cost, they're being shortsighted."